Provides information on the tools and techniques to transform LaTeX sources into Web formats for electronic publication and to transform Web sources into LaTeX documents for optimal printing. Amazon.com description: Product Description: This is the digial version of the printed book (Copyright Â© 2004). The LaTeX Companion has long been the essential resource for anyone using LaTeX to create high-quality printed documents. This completely updated edition brings you all the latest information about LaTeX and the vast range of add-on packages now available--over 200 are covered! Full of new tips and tricks for using LaTeX in both traditional and modern typesetting, this book will also show you how to customize layout features to your own needs--from phrases and paragraphs to headings, lists, and pages. Detailed techniques for generating and typesetting contents lists, bibliographies, indexes, etc. Nearly 1,000 fully tested examples that illustrate the text and solve typographical and technical problems--all ready to run! 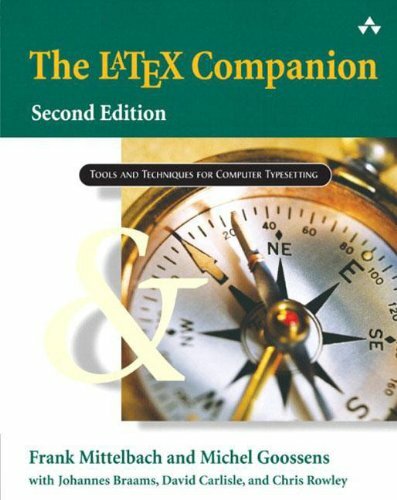 Like its predecessor, The LaTeX Companion, Second Edition, is an indispensable reference for anyone wishing to use LaTeX productively. The accompanying CD-ROM contains a complete plug-and-play LaTeX installation, including all the packages and examples featured in the book. About: Provides information on the tools and techniques to transform LaTeX sources into Web formats for electronic publication and to transform Web sources into LaTeX documents for optimal printing.